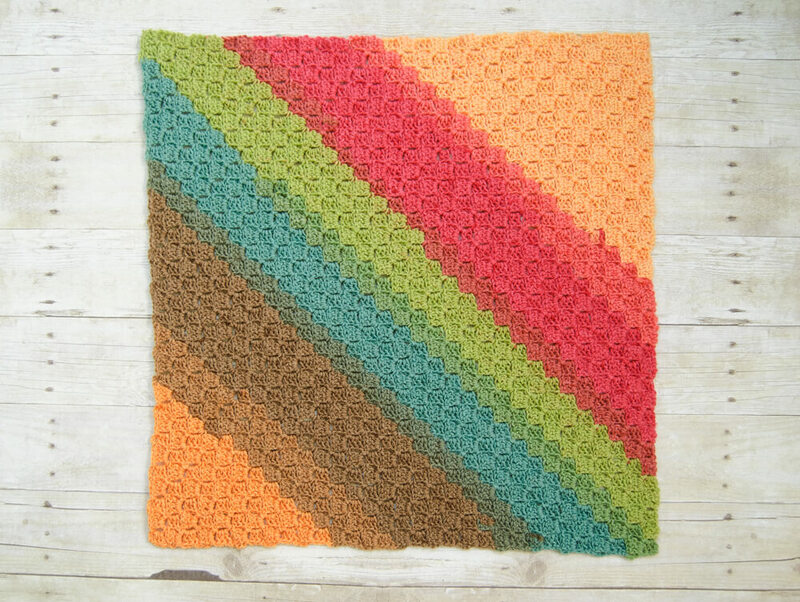 This colorful baby blanket uses a popular crochet technique called corner to corner crochet, or C2C crochet. 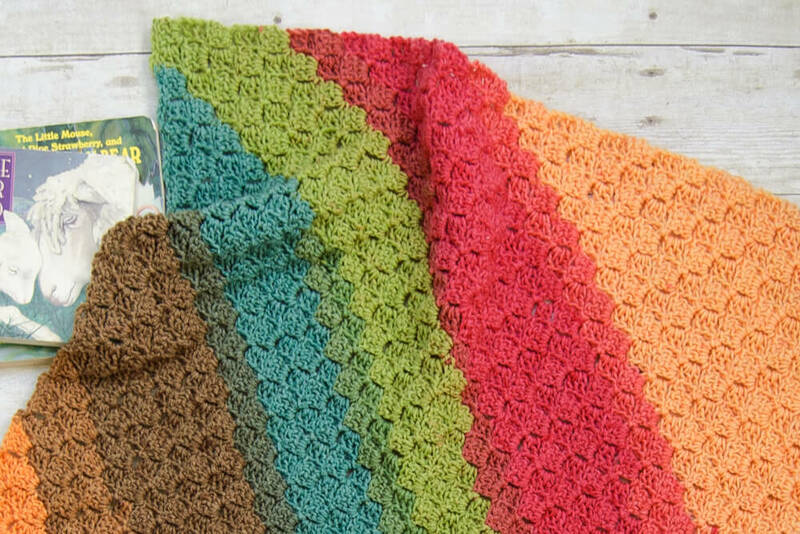 As the name implies, corner to corner crochet is worked diagonally, increasing from one corner until a desired size and then decreasing to the opposite corner. For this project I used the diagonal crochet box stitch, a C2C stitch that creates a beautifully textured design. I chose Lion Brand Cupcake yarn for this because I absolutely adore these amazing happy colors! Don’t you just love them?! One ball makes a 24 in. square baby blanket that is perfect for a newborn or to use as a car seat blanket. But you are not limited to that size. The pattern can be followed as written to make any size you need. Just increase your yardage and keep increasing to any size you like! You can reference some common baby blanket sizes for different usages here. Finished size as written is 24 inches x 24 inches, but pattern can be followed to make any size desired. If you are limited to a certain yarn yardage, a helpful trick is to weigh your yarn before beginning and then work the increase rows until your yarn weighs a touch over half of the beginning weight (it’s better to err on the side of just over half than under). Then start working the decreasing rows. For example, my ball of yarn was 146 grams so I worked increasing rows until it weighed just over 73 grams, then I started decreasing. 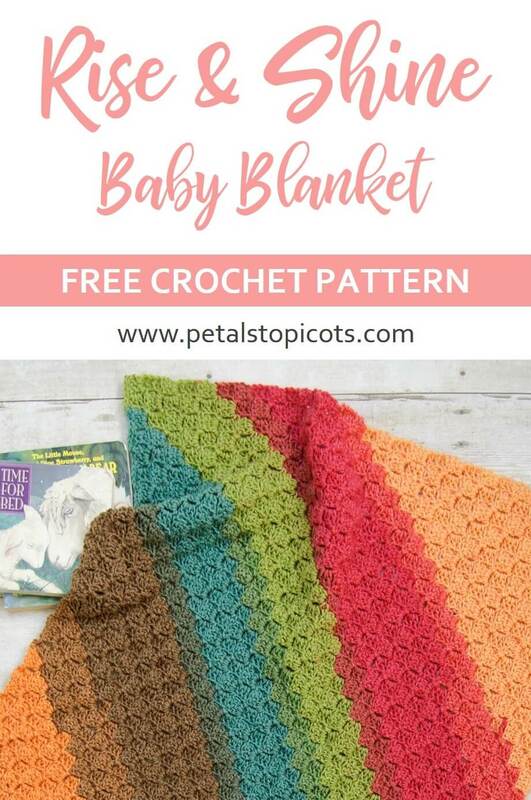 This corner to corner baby blanket is worked with little boxes of double crochet stitches; each box consists of 4 double crochets (a turning chain + 3 dc). The rows are counted on the diagonal with one box for Row 1, 2 boxes for Row 2, 3 boxes for Row 3, and so on, as you increase and then decreasing by 1 box for every row decreasing. If you are more of a visual learner, Bluprint has a step by step photo tutorial of the stitch here that you may find helpful. Row 1: Ch 6, work 1 dc in 4th chain from hook and each of the next 2 chains, turn your work — 1 box. Row 2: Ch 6, work 1 dc in 4th chain from hook and into each of the next 2 chains, slip stitch between the 3rd dc and turning chain of block from previous row, ch 3, work 3 dc in same space, turn — 2 boxes. Row 3: Ch 6, work 1 dc in 4th chain from hook and into each of the next 2 chains, Sl st between 3rd dc and turning chain of previous block, ch 3, work 3 dc in same space, Sl st between the 3rd dc and turning chain of next block, ch 3, work 3 dc in same space, turn — 3 boxes. Rows 4: Ch 6, work 1 dc in 4th chain from hook and into each of the next 2 chains, Sl st between the 3rd dc and turning chain of previous block, ch 3, work 3 dc in same space, *Sl st between turning ch and 1st dc of next block, ch 3, work 3 dc in same space, rep from * across row, turn — 4 boxes. Rows 5 through 31: Repeat Row 4 until size desired or until Row 31 — every row increases by 1 box ending with 31 boxes for Row 31. Row 32: Sl st into each of the 3 dc and into the space between the 3rd dc and turning chain of previous block, ch 3, work 3 dc in same space, *Sl st between turning ch and 1st dc of next block, ch 3, work 3 dc in same space, rep from * across row until 1 block remains, Sl st between turning ch and 1st dc of last block, turn — 30 boxes. Rows 33 through 61: Repeat Row 32 — every row decreases by 1 box until only 1 box remains.